Building your own catamaran is another option to getting into your own boat. history and journal of our boat-building adventure with Light Wave. to build a basic cruising catamaran? would never have gotten a catamaran if we hadn’t built it ourselves. things you will ever do. There are several big pluses to building your own boat. wire, hose, bolt, bulkhead, rib, and support is because you installed them! at anchor or approaching her in our marina, we say, “What a pretty boat! and much further a field (or should we say “an ocean”?). your time to the cause. 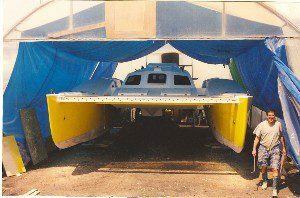 Boat Builder’s Wife“, appeared in Multihulls Magazine in Oct 2000. Chris White (Future link to book review on our web site). fill with water (I must see if I can get a picture of it out of the family archives…..). nice?” The little 30 footer doesn’t seem to be as good and so forth. in almost in direct proportion to its weight. 1 pound of finished boat. is 8,000 lbs., it will probably take about 6,000 hours to build. This decision process took 8 months and I figured we’d launch in 6 months. full plans and we were off and running. exactly an option so I found a small garage nearby that we rented for 5 months. small things. It was like I was building a model. was time to build the hulls. This meant that we had to go larger facilities. projects, big and small, under way. was completed and we walked inside it really hit me, “Wow! this is big! a greenhouse effect in summer! “after” photos. It was time to build the hulls. had built in the garage, and then to install the cuddy cabin, cockpit, and decks. work of fairing the boat before painting. Don’t under estimate that job! and sanding and fairing and sanding…..
the top, you see another summit! on to the next phase – any phase but more sanding! of the dust was gone. we would do differently now. outfitting choices and reasoning for more details. we were ready to launch. To sum it up, building a catamaran was a great experience. We learned a lot.